I’ve been more than a bit absent from actively publishing tattoo-history related research and news on both this website and its companion social media accounts. If you’re curious as to why, I decided to go back to school for a *very intensive* program in data science (like I-can-barely-find-time-to-shower intensive, if that’s any indication of the rigor of this program I’m in). But as with most school-based research projects over the years, I’m focusing my capstone project on something tattoo-related. The concept of digital humanities has long been a favorite of mine to read about and weigh possibilities, but I didn’t have the tech skills in coding and modeling to do that kind of work. Well…now I do! I’ll offer one small glimpse at what I have on tap for the future. 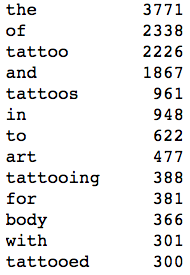 Here’s a quick screencap from some code I wrote that tallies the top word counts of title words in all tattoo books (and marginally tattoo-related books) published between 1850 and today. Looking forward to sharing some really interesting, if visually unexciting, research soon!